Oatmeal is hands-down my favorite breakfast food- in fact, I would say I eat it in some form for breakfast at least 300 out of the 365 days in the year. There’s just something comforting about eating warm oats on a cool morning or eating cold overnight oats on a hot summer morning. It’s also full of fiber for your healthy gut bacteria to feed on and to help keep you full. The thing about oatmeal though, is that it starts off as a wholesome and nutritious food, but if you aren’t careful it could end up packing as much (or more) sugar as a donut or pastry. 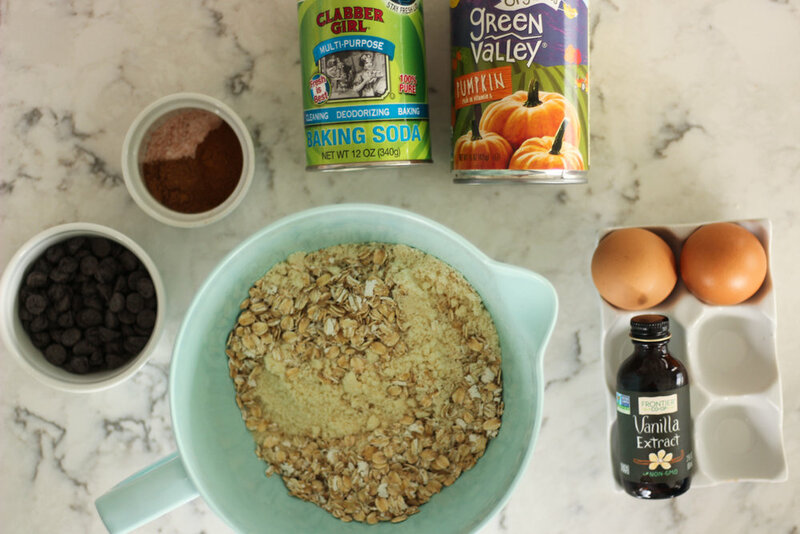 Here I’m going to give you some of my tips for eating oatmeal, including how to avoid a massive sugar spike and crash (because nobody’s got time to be tired at their desk at 10 a.m.). Tip 1: Choose old fashioned rolled oats over quick oats. Old fashioned rolled oats have a glycemic-index of around 55 vs. 79 for the instant variety (1). The glycemic index (GI) is more or less a measure of how quickly a food item is going to raise your blood sugar. The more your sugar spikes, the more insulin your body has to produce to bring your sugar levels down to normal levels. This process is tiring on the body and some people find that they crave even more sugary foods the more their insulin spikes throughout the day. I know for me personally, the more carbohydrate foods I eat (especially in the absence of protein and healthy fats), the more carbohydrate (sugary) foods I crave. People are also more likely to gain weight or have trouble losing weight when insulin levels are consistently high, because the extra glucose that doesn’t get brought into the cell is stored as extra fat. For a few reasons, I also suggest buying a container/bag of straight oats, rather than buying the little packages of oats: 1) The little packages are almost always instant oats 2) They often have added sugars and other questionable ingredients 3) It’s extra waste due to the extra packaging of the oats. Of course, there are special circumstances when I might suggest buying the packets of little cups (like when traveling), but I’m just talking about in general here. Many stores also sell oats in bulk, but if you are trying to avoid gluten, I wouldn’t suggest buying them out of bins (due to the risk of cross-contamination with other gluten-containing grains if they don’t clean the containers well). When you think of ½ cup of dried oats, it really doesn’t seem like a large portion at all, but by the time you cook the oats it expands to an ample serving. I suggest limiting your portion to about ¼ cup of dried oats at a time. I actually keep a glass container of oats on my counter and keep a ¼ cup measuring cup in there to scoop into my bowl. I’m by no means a dietitian who tells people to obsessively measure out their food, it just happens to be convenient to have a scoop inside the oat jar. Of course, always listen to your body and pay attention to your hunger cues. Some of you will need MORE or even LESS of a serving. I keep a measuring cup conveniently in my oat jar. Tip 3: Make your bowl more about the toppings (healthy fats and protein) than the oats. Okay, so by now you might be thinking “there’s no way ¼ cup of oats is going to fill me up, does she want me to starve?” The idea here is for you to get MORE energy out of your oats, and the way you will do that is by adding in healthy fats and protein and a boost of antioxidants (if desired). · Chia or flax seeds for a nice boost of healthy fats and extra fiber. · About 1 Tablespoon of plain or vanilla yogurt. I find that the tartness from the yogurt makes me not miss having added sugar! Soooo....Why the focus on healthy fat and protein? To keep it simple, the healthy fats and protein will help keep you full longer and will slow the release of sugar (from the oats and fruit) into your blood stream. 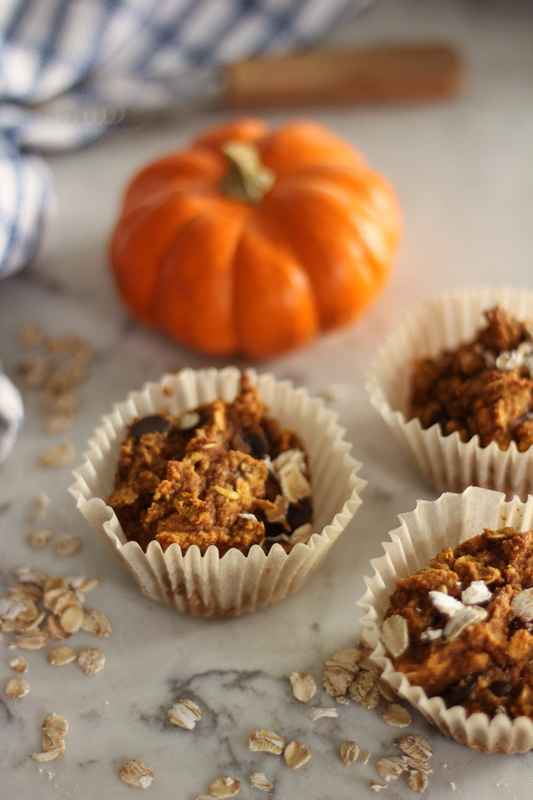 Check out my favorite hot oat recipe below and let me know what you think! Happy eating! 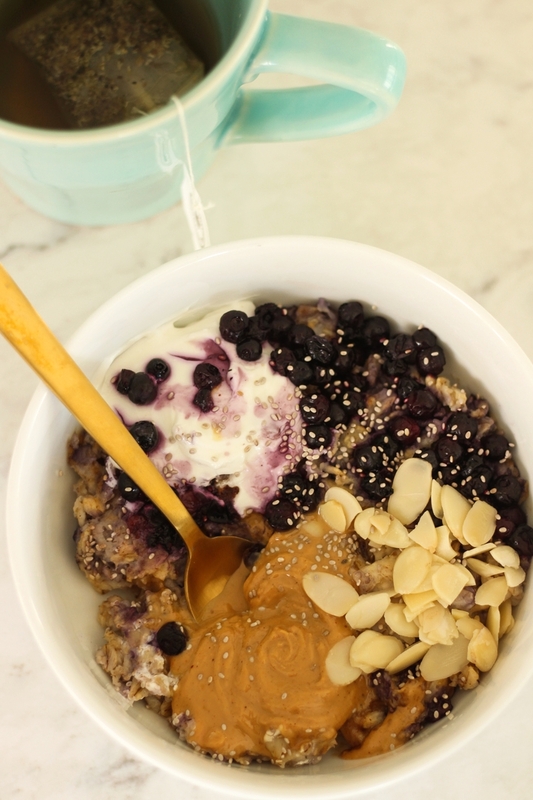 Comforting oatmeal with a focus on healthy fats. 1. Combine oats, frozen blueberries, and water or milk in a microwave-safe bowl and cook per package instructions in microwave (or use the stove but it will take a little longer). 2. Mix in the rest of the toppings (nut butter, cinnamon, flax/chia, and yogurt). 3. Enjoy. (1)Atkinson, Foster-Powell, & Brand-Miller, 2008. International Tables of Glycemic Index and Glycemic Load Values: 2008. Diabetes Care, 31:2 (December), 2281-2283. Fall in Michigan just screams all things pumpkin, so I figured it would be a shame if I didn't pick up some cans of pumpkin purée and see what I could whip up in the kitchen. My mom would always make homemade pumpkin bread when I was younger and we would just devour slices of it with butter spread on top. Instead of using white flour like most bread recipes use, I decided to use a combination of almond flour AND old fashioned oats for this recipe because I happened to have both on hand. I also wanted to boost the nutritional value (fiber and healthy fats) and reduce the glycemic index a bit. My family (which includes my husband and 2-year old daughter) may or may not have eaten 2-dozen of these within 3 days. I would highly suggesting putting a little bit of grass-fed butter or nut butter on them because, well, do I need an explanation? These are super easy to make! You literally just combine the wet and dry ingredients together with a spoon and bake for about 22 minutes! 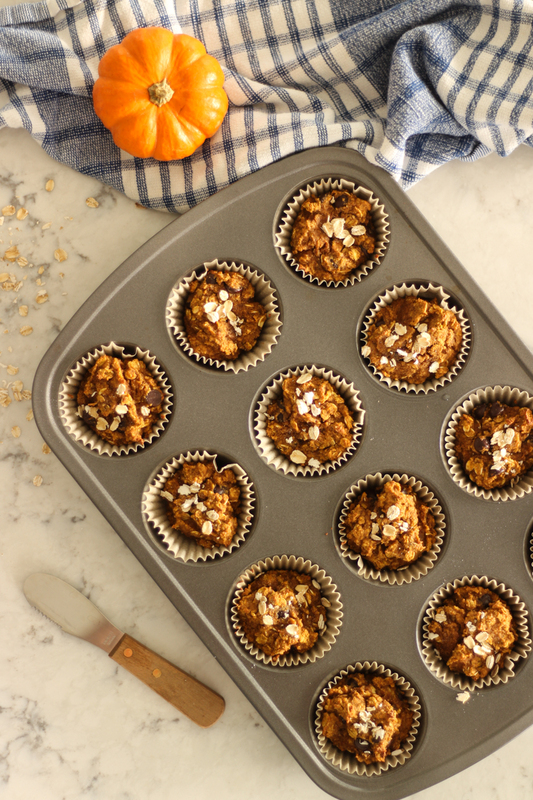 Delicious pumpkin muffins made with almond flour and oats. 1. Pre-heat oven to 350F. 2. Line muffin pan with parchment paper liners (if using). 3. Combine all dry ingredients (minus chocolate chips) in one bowl and all wet ingredients in a second bowl. 4. Pour wet ingredients over dry and stir well with a spoon (do not over-mix). 5. Fold in chocolate chips 6. Spoon equal amounts of batter into each cupcake tin and then bake on 350 for 20-25 minutes until a toothpick inserted comes out clean. Does this recipe sound good? Pin it for later!